Social e-reading app Readmill is rolling out an important update on Tuesday, making it simpler and easier for readers to use — and for publishers to integrate with the service. 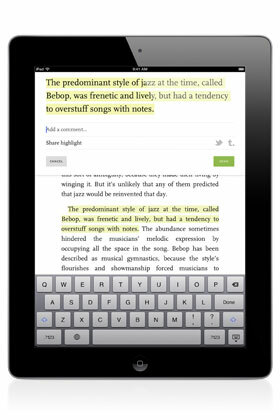 The latest version of the iPad app — which adds a social layer to reading, allowing you to highlight and share DRM-free e-books — will include two new features that simplify life for those on both sides. First, the “Library” function simply creates a cloud-based index of all the book files you have access to, allowing you to access them all with a touch — wherever they are stored. It’s something that seems obvious, but is missing from the current picture thanks to the widely varying approaches taken by independent online retailers. Meanwhile the Berlin-based company is also giving publishers an easy-to-embed “send to Readmill” function that allows users to send a copy of a book they’ve just purchased to their library without any fuss. Both are essentially two sides of the same thing: trying to make the experience smoother and more straightforward for people who purchase from indy bookshops. And between them, these moves could help level the playing field between large, closed systems and small, open ones, says the company’s community manager, Matthew Bostock. The new services already have some pretty good partners, launching in conjunction with a range of companies from the start: A Book Apart, Bookrix, Leanpub, Free-ebooks.net, Jotify, OR Books, Publit and Bibliocrunch. 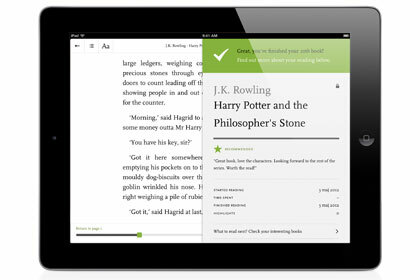 It’s also teaming up with Readability to support its new Readlists feature. It’s also got some good news on the funding front too, with Wellington Partners (Spotify, Xing, Hailo) backing the company with a Series A funding for an undisclosed amount. In the grand scheme of things these features are probably a minor update — but right now it feels like it could be a significant step forward for the company, which has a great idea but is hampered by the fact that a significant amount of the e-reading market is owned and controlled by competitors who are extremely closed and use lots of DRM.